Draft: 2008, Los Angeles Dodgers, 4th rd. Devaris Strange-Gordon…resides in Windermere, FL…son of former Major League pitcher Tom Gordon…grew up playing basketball and did not start playing baseball until his senior year at Avon Park (FL) HS…named NCCAA II National All-Tournament MVP and batted .378 with 45 stolen bases in 59 games for NAIA Southeastern (FL) University… transferred to Seminole State (FL) College in 2008, but did not play before being drafted. The Totals - Hit .268 (149x556) with 62 runs, 17 doubles, 8 triples, 4 home runs, 30 stolen bases and 36 RBI in 141 games with the Mariners... Tablesetter - When he recorded at least 1 hit, the Mariners were 59-39 (.602), compared to a team record of 18-25 (.419) when he went hitless...Leaderboard - Tied for the Major League lead with 36 infield hits (also: Jean Segura)…ranked T2nd in the Majors with 8 bunt hits…was T3rd in MLB with 9 sacrifice hits…ranked T5th in the American League/T9th in the Majors with 30 stolen bases..Speed Racer - Recorded his 300th career stolen base on July 3 vs. Los Angeles-AL… is 1 of 5 active players with at least 300 career steals, joining José Reyes (517), Ichiro Suzuki (509), Rajai Davis (415) and Jacoby Ellsbury (343)...Good Start - Began the season with a 12-game hitting streak, spanning March 29 - April 14…hit .346 (18x52) with 8 runs, 1 double, 1 home run, 4 RBI and 7 stolen bases over that span...Multi-Hit Madness - Recorded 5 consecutive multi-hit games, April 28 - May 3, going 16-for-23 (.696) with 7 runs, 3 doubles and 1 RBI…finished the season with 35 multi-hit games, tied with Nelson Cruz for 3rd-most on the club...High Five - Went 5-for-5 on May 1 vs. Oakland, becoming the first Mariner with 5 hits in a game since Mitch Haniger (9/20/17 at LAA)…also had 4 hits on April 29 at Cleveland, becoming one of three players in club history with 4+ hits in back-to-back games (also: Kendrys Morales and Ichiro Suzuki)...Hot - In the month of July, hit .323 (30x93) with 10 runs, 1 double, 2 triples, 2 RBI and 4 steals in 23 games…his 30 hits tied for 7th-most in the AL in July....Gone - Homered in back-to-back games for the 1st time in his career, Sept. 22-24… overall, his 4 home runs equaled his career-high (also: 2015 w/MIA)...On a Roll - Hit safely in 11 straight games, June 12 - 23, batting .367 (18x49)....DL - On 10-day disabled list (fractured right great toe), May 22 (retro to 5/21) - May 31. The Totals - Hit .308 (201x653) with 114 runs, 20 doubles, 9 triples, 2 home runs, 33 RBI and 60 stolen bases in 158 games with Miami... Leading the Way - Led the Major Leagues in stolen bases and singles (170)…among National League leaders, also ranked 2nd in at-bats, T2nd in hits, T3rd in triples, 4th in runs and 9th in batting and games... Hit Parade - Matched a career-high with 59 multi-hit games (also: 2015)… ranked T3rd in the Majors in multi-hit games (also: Jose Altuve-HOU) in 2017... At the Plate and On the Bases - Became the first player to record at least 200 hits and at least 60 stolen bases in a season since Juan Pierre-FLA (204 H, 65 SB) in 2003... An Even 200 - On Sept. 30 vs. Atlanta, went 3-for-4 to reach the 200-hit plateau for the second time (also: 2015, 205 H)…joins Ichiro Suzuki (10), Jose Altuve (4), Robinson Canó (2) and Dustin Pedroia (2) as the only active players with multiple 200-hit seasons... Streaking - Recorded a career-high 17-game hitting streak, Aug. 27 - Sept. 14…during the streak, hit .392 (29x74) with 11 runs, 2 triples, 1 home run, 3 RBI and 7 stolen bases… was one of 8 players in the Majors to post at least 3 separate hitting streaks of 10-ormore games apiece (also: Ben Gamel, Charlie Blackmon, Brett Gardner, Odubel Herrera, Francisco Lindor, Mike Moustakas and Joey Votto)... On a Roll - From May 19 through the end of the season, hit .328 (162x494), the 6thhighest average in the Major Leagues during that span... Career Year - Set career-bests in games (158), at-bats (653), runs (114) and HBP (10)... The Nomination Goes To... - Named Miami's nominee for the 2017 Robert Clemente Award. Hit .268 (87x325) with seven doubles, six triples, one home run and 14 RBI in 79 games with Miami. 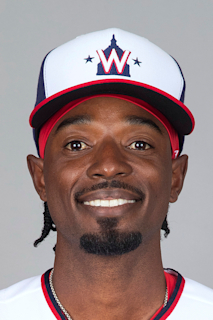 Missed 80 games after being found in violation of MLB's Joint Drug Prevention and Treatment Program...Finished season with 30 SB in 79 games; just sixth player since 1990 with at least 30 SB in 79 G or less, joining Trea Turner (also 2016), Emilio Bonifacio in 2012 with Marlins, Coco Crisp in 2010, Vince Coleman in 1991, and Alex Cole in 1990...On April 5 vs. Detroit, had first career game with three-or-more extra-base hits; doubled in sixth, tripled in eighth and doubled in ninth...According to Elias, was first-ever reigning batting champ with three extra-base hits in first game of next season...Followed Opening Day feat with three hits in second game of season, second of seven three-plus hit games...Worked 16-pitch at-bat against Jim Henderson in eighth inning on April 12 at Metss, marking longest at-bat in Club history. - STATS LLC...Placed on restricted list on April 29 and was reinstated on July 28...Made nine rehab appearances at Triple-A New Orleans prior to reinstatement, recording nine hits in 35 at-bats (.257)...Recorded 200th career stolen base on August 10 vs. San Francisco; has 88 stolen bases with Marlins, ranking eighth on Club's all-time list...Had 13th career game with three-or-more stolen bases on September 24; only Billy Hamilton (14) has more such games since start of 2011...Scored a run in career-long six consecutive games (nine total) from Aug. 3-9...Recorded season-long 10-game hitting streak from September 5-18, batting .313 (15x48) in that time...Led Majors with 14 stolen bases in September. Was just sixth Miami player (ninth time) to reach 14-or-more steals in a calendar month, joining Luis Castillo (19 in May 2000; 16 in August 1999), Juan Pierre (17 in July 2005; 16 in June 2003; 14 in July 2003), Emilio Bonifacio (16 in July 2011), Chuck Carr (16 in September 1993), and Hanley Ramirez (14 in August 2007)...Only Billy Hamilton (19 in August & 16 in July) and Starling Marte (15 in July) had better months...Hit only home run of season to lead off Sept. 26 game against Mets, Miami's first game following death of José Fernández. Recorded season-high four hits in the contest. Was fourth career leadoff home run...Recorded atleast one hit in 17 of 20 games to finish out season, hitting .306 (26x85) with 12 runs scored over that span. Earned Louisville Slugger® Silver Bat after locking down National League batting championship with .333 average (205x615) and MLB-leading 205 hits. Also led Majors in stolen bases for second consecutive season with 58...Among postseason honors, earned Louisville Slugger® NL Silver Slugger™ Award (2B), Rawlings® NL Gold Glove Award (2B), Wilson® Defensive Player of the Year (2B) and South Florida BBWAA team MVP...According to Elias, was second NL player (seventh in MLB) since 1900 to lead his league in hits, average and stolen bases. Honus Wagner was the only other NL player...Additionally, from Elias, became first player to lead NL in average and stolen in same season since Jackie Robinson (.342/37) in 1949 for Brooklyn Dodgers... Was just second player in Club history to win NL batting crown; Hanley Ramirez led NL with .342 average in 2009...Paced Majors with 25 three-hit games and led NL with 59 multi-hit contests: ranked second in MLB behind Ian Kinsler's 61...Had most three-plus hit games in single season in Club history, surpassing Hanley Ramirez's 24 in 2009...Was second Marlins' player with at-least 59 multi-H G and 58 SB (Juan Pierre, 60/65 in 2003)...Set career highs in plate appearances (653), hits, home runs (4) and RBI (46), and tied career high in doubles (also, 24 in 2014)...Led NL second basemen in fielding percentage (.992), committing just six errors in 733 total chances...Earned second consecutive NL All-Star nod after batting .338 (122x361) prior to break, though did not participate due to injury...Owned .333 average at home and on road. Road mark was best in NL and tied with Ben Revere for tops in MLB. His average at Marlins Park ranked fifth in NL and 10th in MLB...Hit .350 (56x160) against left-handed pitching, setting new Club mark for average by left-handed hitter vs. left-handed pitcher; previous best was .333 by Cliff Floyd in 2000...Recorded career-high tying and Club record-tying four stolen bases on May 22 vs. Baltimore. Reached total again on August 25; Luis Castillo is only other Marlins player with four steals in a game (May 17, 2000 vs. San Diego)...Hit first leadoff home run of season, third of his career, on Aug. 12 vs. Boston...Missed All-Star game after dislocating left thumb on July 12. Returned from rehab and reinstated from 15-day DL on July 28; went 1x4 in lone rehab appearance with Single-A Jupiter...At All-Star break, led Majors in hits (122) and three-hit games (18), while leading NL in multi-hit games (32)... Became first player in Club history to lead MLB in hits at All-Star break...Set new Club record with 122 hits prior to All-Star break (previous, 117 by Juan Pierre in 2003 and Hanley Ramirez in '07)...He and Juan Pierre (117 H, 44 SB in 2003) are only players in Club history to record at least 117 H and 30 SB prior to All-Star break...Hit first career inside-the-park home run on June 30 vs. San Francisco; marked first ITP home run in Marlins Park history and first by Marlins player since Cameron Maybin (May 31, 2010 vs. Milwaukee)...Recorded 100th hit on June 19 at Cincinnati (65 G), becoming fastest player in Club history to reach 100 hits; previous mark was 70 games by Luis Castillo in 2000...Tied career high and Marlins franchise record with five hits on April 18 at Citi Field against Mets. Marked first five-hit game by a Marlins hitter since Giancarlo Stanton on Aug. 11, 2010 at Washington. Martin Prado and Christian Yelich would equal the five hit mark over remainder of season, becoming first trio each with five-hit games in same season since Miguel Cabrera, Miguel Olivo and Josh Willingham in 2007. In first full season with Dodgers, led Majors in stolen bases (64), triples (12) and in?eld hits (55). Set career highs in games (148), runs scored (92), hits (176), doubles (24), triples, home runs (2) and RBI (34)...Was just seventh player in baseball history to lead Majors in stolen bases (64) and triples (12) in same season. His 64 stolen bases tied for fourth on Dodgers' all-time single season stolen base list (Juan Pierre, 2007)...Tied for ?fth in National League in hits with Jonathan Lucroy and Anthony Rendon...Batted .314 (66x210) with runners on base and .306 with runners in scoring position (38x124)...Led NL with 19 3+-hit games, including a career-high ?ve hits on May 3 at Miami...Connected for second career leadoff home run on April 8 vs. Detroit. Previous was on May 1, 2012 at Colorado...Hit .292 (105x359) with 52 runs cored, 14 doubles, nine triples, two home runs and 25 RBI prior to All-Star Break to garner ?rst career All-Star nod. Went 0x1 with a run scored in Minneapolis on July 15.• Posted career-long 13-game hitting streak from September 2-20...Hit .364 (24x66) with 17 runs scored over streak.• Started all four games of Dodgers' Division Series against St. Louis, batting .176 (3x17) with two RBI and one stolen base. Went hitless in Game 1 with one RBI, and went 1x4 in Games 2-4. Made his first career season-opening roster and also his first Opening Day start on April 5 at San Diego. Ranked eighth in the NL with 32 steals in 42 attempts (76.2%)...posted seven multi-steal games with the Dodgers going 7-0 in those contests...tied a career-high with three steals on three occasions, which tied with Mike Trout and Everth Cabrera for the MLB lead for most games with three or more stealsBatted .296 in close and late situations (16-for-54). Hit .308 (12-for-39) in 13 games when in the eighth spot in the lineup. Hit the first home run of his career with a leadoff shot off Colorado's Jhoulys Chacin on May 1 at Coors Field. Stroked a pair of ninth-inning walk-off singles this season, doing so in the Dodgers' 5-4 win over San Diego on April 15 and their 2-1 victory over the White Sox on June 17. Missed 58 games from July 5-Sept. 10 with a UCL tear in his right thumb, suffered while stealing third base on July 4 against the Reds...made eight rehab starts for Triple-A Albuquerque and reinstated from the DL on Sept. 11. Batted .379 with a .446 on-base percentage in 23 Cactus League games...stole 11 bases in 15 attempts. Appeared in 56 games over two stints with the big league club...Named to the Topps Major League Rookie All-Star Team, becoming the first-ever Dodger shortstop to receive the honor...Had the second-highest batting average among Major League rookies (min. 200 AB) with a .304 mark, including a .316 mark (47-for-150) against right-handed pitchers...was the fifth-highest batting average ever by a Los Angeles Dodger rookie...Ranked fifth among NL qualifiers with a .345 batting average in 34 games after the All-Star break (49-for-142)...Hit .248 with two strikes (29-for-117), which ranked 11th among National Leaguers with 120 or more plate appearances...Scored 34 runs in just 56 Major League games...Had his contract purchased from Triple-A Albuquerque on June 6 and made his Major League debut in the ninth inning as a pinch-runner that night, scoring a run on a groundout by Andre Ethier...became the first Dodger to make his debut as a pinchrunner since Wilton Guerrero (now a Dodger scout) on Sept. 3, 1996...Made the first start of his career on June 7 at Philadelphia and had three hits in his first three plate appearances... Missed 20 games from Aug. 10-Sept. 1 on the disabled list due to a right shoulder contusion, which he suffered while tagging out Kelly Johnson in a third-inning rundown on Aug. 6 at Arizona...Hit just .232 (19-for-82) during his first stint with the Dodgers from June 6-July 4...recalled on July 31 when Rafael Furcal was traded to St. Louis...Recorded 24 stolen bases in 31 attempts (77.4%), which ranked as the fifth-most steals by a Dodger rookie and the most for a rookie since Todd Hollandsworth's 21 in 1996...tied with the Cubs' Tony Campana for second in steals among big league rookies behind only Minnesota's Ben Revere's 34 steals...overall, tied for 14th in the NL in steals...Became the first Dodger since Harvey Hendrick on June 12, 1928 to steal second, third and home in the same inning, doing so in the seventh inning on July 1 against the Angels in Anaheim...Voted the September recipient of the Gillette presents NL Rookie of the Month Award, batting .372 (42-for-113) with 21 runs, 12 steals, seven doubles, one triple and six RBI in 26 games...led the circuit with 42 hits and ranked second in the league in stolen bases...Batted .400 (18-for-45) during his career-long 11-game hitting streak from Sept. 13-24...ended the season by hitting safely in 14 of his last 15 games at a .391 clip (25-for-64)...Set a career high with four hits Sept. 8 at Washington...had 22 multi-hit games in his 51 starts, including seven games with three or more hits...Overall, batted .333 with 10 doubles, six triples, 24 RBI and 30 steals in 34 attempts over 70 games with the 'Topes...had 31 multi-hit games, including nine games with three or more hits...With Albuquerque, batted .344 with runners in scoring position (22-for-64) and hit .324 (34-for-105) with runners on base...Including two steals during a minor league rehab with Rancho Cucamonga, ranked second among Dodger minor leaguers with 32 combined stolen bases...voted by Pacific Coast League managers as the fastest runner in the league and was tied for third in the league in steals at the time of his most recent promotion. In 2008, ranked fourth in the Pioneer League witha .331 average, finished 10th with a .371 on-base percentage and tied for sixth with 83 hits...following the season, wasnamed by Baseball America as the No. 4 prospect in the Pioneer League...selected in the fourth round of the 2008 First-YearPlayer Draft. May 31, 2018 Seattle Mariners activated 2B Dee Gordon from the 10-day injured list. May 22, 2018 Seattle Mariners placed CF Dee Gordon on the 10-day disabled list retroactive to May 21, 2018. Right great toe fracture. July 28, 2016 Dee Gordon roster status changed by Miami Marlins. July 19, 2016 sent 2B Dee Gordon on a rehab assignment to New Orleans Zephyrs. April 29, 2016 Miami Marlins placed 2B Dee Gordon on the restricted list. July 28, 2015 Miami Marlins activated 2B Dee Gordon from the 15-day disabled list. July 26, 2015 Miami Marlins sent 2B Dee Gordon on a rehab assignment to Jupiter Hammerheads. December 27, 2013 SS Dee Gordon assigned to Indios de Mayaguez. September 1, 2013 Los Angeles Dodgers recalled 2B Dee Gordon from Albuquerque Isotopes. August 16, 2013 Los Angeles Dodgers optioned Dee Gordon to Albuquerque Isotopes. August 5, 2013 Los Angeles Dodgers recalled Dee Gordon from Albuquerque Isotopes. May 27, 2013 Los Angeles Dodgers optioned Dee Gordon to Albuquerque Isotopes. May 4, 2013 Los Angeles Dodgers recalled Dee Gordon from Albuquerque Isotopes. March 26, 2013 Los Angeles Dodgers optioned Dee Gordon to Albuquerque Isotopes. October 14, 2012 SS Dee Gordon assigned to Tigres del Licey. September 11, 2012 Dee Gordon roster status changed by Los Angeles Dodgers. August 30, 2012 Los Angeles Dodgers transferred SS Dee Gordon from the 15-day disabled list to the 60-day disabled list. August 24, 2012 sent SS Dee Gordon on a rehab assignment to Albuquerque Isotopes. July 5, 2012 Los Angeles Dodgers placed SS Dee Gordon on the 15-day disabled list. Torn right thumb ligament. September 1, 2011 Los Angeles Dodgers activated SS Dee Gordon from the 15-day disabled list. August 28, 2011 sent SS Dee Gordon on a rehab assignment to Rancho Cucamonga Quakes. August 11, 2011 Los Angeles Dodgers placed SS Dee Gordon on the 15-day disabled list retroactive to August 10, 2011. Bruised right shoulder. July 31, 2011 Los Angeles Dodgers recalled Dee Gordon from Albuquerque Isotopes. July 4, 2011 Los Angeles Dodgers optioned Dee Gordon to Albuquerque Isotopes. June 6, 2011 Los Angeles Dodgers selected the contract of Dee Gordon from Albuquerque Isotopes. April 5, 2011 Dee Gordon assigned to Albuquerque Isotopes from Chattanooga Lookouts. January 26, 2011 Los Angeles Dodgers invited non-roster SS Dee Gordon to spring training. October 22, 2010 SS Dee Gordon assigned to Gigantes de Carolina. April 4, 2010 Dee Gordon assigned to Chattanooga Lookouts from Los Angeles Dodgers. March 11, 2010 SS Dee Gordon assigned to Los Angeles Dodgers. April 8, 2009 SS Dee Gordon assigned to Great Lakes Loons from Ogden Raptors.